A dominant area of focus in instructional planning, instruction and assessment is technology. To me, technology includes more than just computers and tablets. I think whiteboard walls, post its, markers and colorful pencils and pens are all technology too. Whatever technology we thoughtfully choose to integrate into our planning and teaching is a central support for our students to learn and grow over time. Learner success is our central focus here at Kirkwood. This ideal is more than just a graphic that is witness to our Mission, Vision and Values. We live this mission each day in KCELT. Our focus for faculty interactions this past month has been technology. We have had instruction time with Discussion forums, rubric creation, voice over in PowerPoint and close captioning in YouTube. While the skills to successfully launch these tools was taught, the conversations and collegiality among participants will contribute to richer faculty-student collaborations. We are our own best resources to successfully differentiate instruction. The energy in leading this faculty to learn new tools and engage in thoughtful conversation is just amazing. We not only discuss the how-to, but we engage in discussing how our students approach their learning and how we can manage our activities and technology resources to meet student needs in instruction and assessment. This ranges from using TALON to have practice exams to creating online discussions to enhance face to face course interactions. Coffee and Data Points is exploding on our campus. 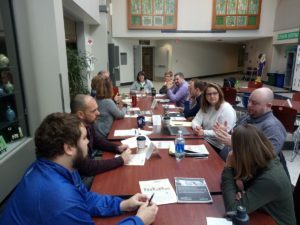 Just take a look above at this diverse group of faculty and staff discussing the trends of Community College student population AND how we can support our students taking this data into consideration. Thanks Dan Tuuri and Cort Iverson for leading this important work. We take the time for the conversation BUT we keep the work moving forward. This is a great collab between KCELT and BIT, in a shared effort to share information and facilitate dialogue. Thanks for sharing!